This is usually where fans and players say their team had more heart than their opponents. I do not jump on the bandwagon that says the championship team had more heart than the others. However, I will do my best to convey how and why the Twins won the AL West, flew by the better-on-paper Detroit Tigers and took down the speedy St. Louis Cardinals in an exciting seven-game World Series. The Blue Jays’ George Bell won the American League MVP award that season, but an argument could be made that Bert Blyleven and Frank Viola should have shared it. Without those two starting pitchers, the Twins could have found themselves at the bottom of the AL West. As a team, the Twins had a 4.63 ERA. Take away Viola and Blyleven’s numbers and the Twins’ ERA jumps to 5.29. The top two starters combined for a 3.47 ERA, 32 wins and 518 2/3 of the team’s 1,427 1/3 innings pitched. Blyleven’s season was even more amazing as he approached the single-season record of home runs allowed that he’d set the previous season with 50 (see: https://tripleinthegap.wordpress.com/2010/08/19/blyleven-scattered-50-home-runs-throughout-1986/). The Dutchman gave up 46 in ’87. Although I’ve pointed out the many misfires in the Twins’ pitching staff, there were a few others who could be counted on. Les Straker had spent the previous 10 seasons in the minors for the most part. He emerged in ’87 to win eight games and sport a 4.37 ERA with 154 1/3 innings pitched. More importantly, Straker pitched nine innings over two starts in the World Series and held the Cards to four runs. Many argue he was prematurely taken out of the third game in St. Louis after pitching six shutout innings and holding a 1-0 lead. Juan Berenguer allowed three runs after pitching only 1/3 of the seventh inning and the Cardinals went on to win 3-1. Speaking of Berenguer, aside from his performance in the World Series, the Panama-born relief pitcher was a rare bright spot in the bullpen. Signed as a free agent before the season, Berenguer won eight games, lost only one while sporting a 3.94 ERA. He proved even more valuable against the Tigers in the ALCS, pitching six innings of relief and allowing only one run and one hit while striking out six. Berenguer recorded a five-out save in the second game, racking up four strikeouts. Keith Atherton wasn’t great, but wasn’t bad coming out of the bullpen. The glasses and mustache-wearing Virginia native won seven games with a 4.54 ERA. Like the Twins of 2010, the ’87 squad didn’t give its competition many free chances. Minnesota led the league in fielding percentage in ’87 (.984) and had the least number of errors as well (98). Kent Hrbek (1B), Gary Gaetti (3B), Dan Gladden (LF) and Tom Brunansky (RF) were all in the top five at their respected positions in fielding percentage in the American League. The Twins didn’t have an entirely dangerous lineup, but there were four batters in the middle of the lineup who were known to put a few balls in the gaps and seats. Minnesota hit 196 home runs in ’87; 125 of those were hit by Kirby Puckett (28), Kent Hrbek (34), Tom Brunansky(32) and Gary Gaetti (31). Opposing pitchers had to feel a huge relief when they got through these four in the lineup. Gaetti wasn’t much of an on-base machine that year (.303 OBP), but he got his hits when they mattered. He knocked in 109 runs and also had 36 doubles. Although Brunansky struck out 104 times, he also drew 74 walks, raising his OBP to .352. Hrbek’s 34 home runs were despite playing in only 143 games. He earned his top slugging season in ’87 with a .545 mark while drawing 84 walks and struck out only 60 times. And then there’s Puckett. The center fielder tied Kansas City’s Kevin Seitzer with the most hits in the AL with 207. Puckett played 157 games while putting up his staggering, yet consistent offensive numbers (.332 / .367 / .534) while never seeing a pitch he didn’t like and couldn’t hit hard for a single (at least). The biggest smile in baseball also had 32 doubles, five triples, 12 stolen bases, 98 RBI and 96 runs scored. Puckett’s regular season was best known for what he did over two days in Milwaukee, August 29 & 30. The stout-legged Twin went 10-for-11 with two doubles, four home runs, six RBI and seven runs scored. He also robbed another future hall of famer, Robin Yount, of a grand slam of the second game with one of his well-known leaps against the wall. There was also the defense of Greg Gagne and Steve Lombardozzi up the middle, the clutch hitting of Randy Bush, Gene Larkin and Roy Smalley, the speed of Al Newman and the veteran presence of a late-season acquisition, Don Baylor. Manager Tom Kelly was 36-years old when the 1987 season began. 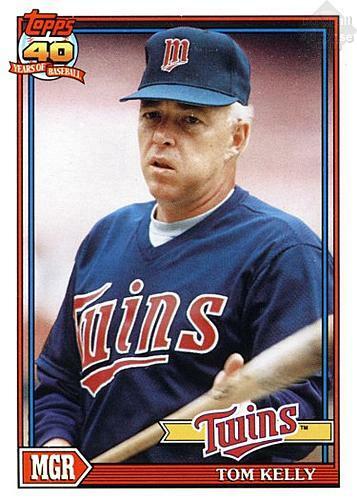 He took over as Twins manager after Ray Miller was fired with 23 games to go in the ’86 season. Kelly won 12 of those 23 games. The no-nonsense manager took a team that should have won about 79 games to World Series champs the next season. Kelly was not in the dugout for the fame, he was there to do a job. This seemed obvious as the Twins celebrated on the field after winning the seventh game of the World Series and Kelly quietly sat on the bench and allowed his players to have this time for themselves. His managing style has stretched to the present day where every Twins team is built on knowing the fundamentals and avoiding physical and mental mistakes; respect the game and your opponent and they will respect you back. Everything I’ve written up until now proves that the 1987 regular season Twins were far from the 1991 Twins or the 1965 Twins, or 1969, ’70, 2002, ’06 or ’10. But when the postseason began and the Metrodome roof nearly popped off from so much noise, the Twins couldn’t be beaten. I mean that literally: they were 6-0 at home in the postseason (2-4 on the road). My mom took my nine-year old 60-pound body to the first game of the championship series against the Tigers were I watched Gary Gaetti launch two homers and my Twins put up four runs in the eighth inning to beat Detroit 8-5. Bert Blyleven pitched the Twins to a 6-3 victory in game two. If it wasn’t for an eighth inning two-run home run from Detroit’s Pat Sheridan, the Twins may have swept the series. Instead, they won games four and five at Tigers Stadium to take the AL pennant; the franchise’s first since 1965. The Twins saved their wins against the Tigers for the playoffs: they were 4-8 against them in the regular season. In the World Series, it was dome, sweet, dome. The Twins outscored St. Louis 33-12 at the Metrodome. Minnesota managed only five runs at Busch Stadium in games three, four and five. Late-season acquisition Don Baylor, who had last hit a home run on August 23 while he was still with the Red Sox. Baylor’s home run was a grand slam against the Twins. After picking him up off the waiver wire, Baylor hit well as a designated hitter, but didn’t show much power. Down 5-3 in the fifth inning of the sixth game of the World Series, Baylor tied the game with a two-run home run. Twins fans will show no shame in saying Baylor only hit one home run for Minnesota. It was Hrbek who blew the game open with his sixth-inning grand slam. I remember hearing the rumor that when the mighty Minnesotan high-fived the Twins’ bat boy before touching home base, he broke the poor kid’s wrist. Don’t quote me on this one as this was a rumor that was circulating through my peers at Columbus Elementary. I realize fourth graders aren’t the most reliable source. I think I still believed in Santa Claus, too. It was this man who allegedly broke the hand of the batboy after his game six grand slam. After batting only .191 for the season, catcher Tim Laudner batted .318 for the series and knocked in four runs. Second baseman Steve Lombardozzi hit a meager .238 in the regular season, but turned into Ty Cobb against St. Louis, batting .412 with four RBI. Dan Gladden, after an average season at the plate and a great season in the field, he finally let his bat match his glove in the postseason. Gladden batted .314 in the ALCS and World Series combined, leading all Twins starters. Puckett batted .357 against the Cardinals and tied a World Series record in Game Six with four runs scored. Frank Viola’s 3.72 ERA and two wins were enough to win him the World Series MVP trophy. Blyleven won one game with a 2.77 ERA. Despite his shakiness during the regular season, Jeff Reardon did not allow a run over four and two-thirds innings. I was nine years old and I had yet to develop the attention span to watch a complete game on television. I did, however, grab the Star Tribune sports page every morning and look at the box scores, standings and statistics. I always went right to Kirby Puckett’s line from the previous game to see if he gained any ground on the batting title (I’d sometimes check Wade Boggs as well in hopes of an 0-for-5 game). I wasn’t much for reading columns and features (unless they involved Kirby), but I would keep an eye on the standings as well as the statistical leaders in each league. I was playing baseball with my neighbor and buddy Brian when the Twins won the AL pennant in Detroit. I remember my mom calling out to me, “Jeff, do you want to watch the Twins in the last inning? It looks like they’re going to win!” “No, that’s okay,” I replied, as I was too content to throw the ball around with Brian to be bothered with my favorite team winning its first pennant in 22 years. I can also remember my dad telling my sister and I after the Twins won the World Series that we should appreciate it while it lasts because we probably wouldn’t see it again. We were fortunate enough four years later to see the Twins celebrating a World Series title and I’m keeping my fingers crossed again this year. The 1987 Minnesota Twins will forever have a place in the hearts of Twins fans. They were the first team to win a World Series since the team moved from Washington D.C. after the 1960 season. The ’87 club is one of two Minnesota teams to take the title and the ’87 club did so despite the fact that there have been many superior teams to play under the Metrodome roof or the sunny skies of Metropolitan Stadium or even Target Field. The 1987 Twins were the underdogs of underdogs and it was a joy to watch them defy all the odds and defeat the St. Louis Cardinals in the World Series at the innocent age of nine. As a nine-year old, I didn’t worry that the Twins pitching would hold out in the playoffs. It didn’t worry me we had to play the 98-win Detroit Tigers in the championship series. It didn’t worry me we would be playing the team of the eighties in the World Series. I couldn’t care less that our closer owned a 4.48 ERA for the season. These facts don’t bother nine-year olds. We had Kirby Puckett and that’s all that mattered. As a 32-year old, I’ve had time to look over the great ’87 Twins and realize how they had no business in the playoffs, let alone winning the World Series. That’s what makes them so great. Baseball fans will never put the Twins of ’87 next to the greatest of all time, but they could easily be put next to the 1980 United States Olympic hockey team. The Minnesota Twins were outscored by their opponents throughout the ’87 regular season. They finished the season with an 85-77 record despite being outscored 786-806. 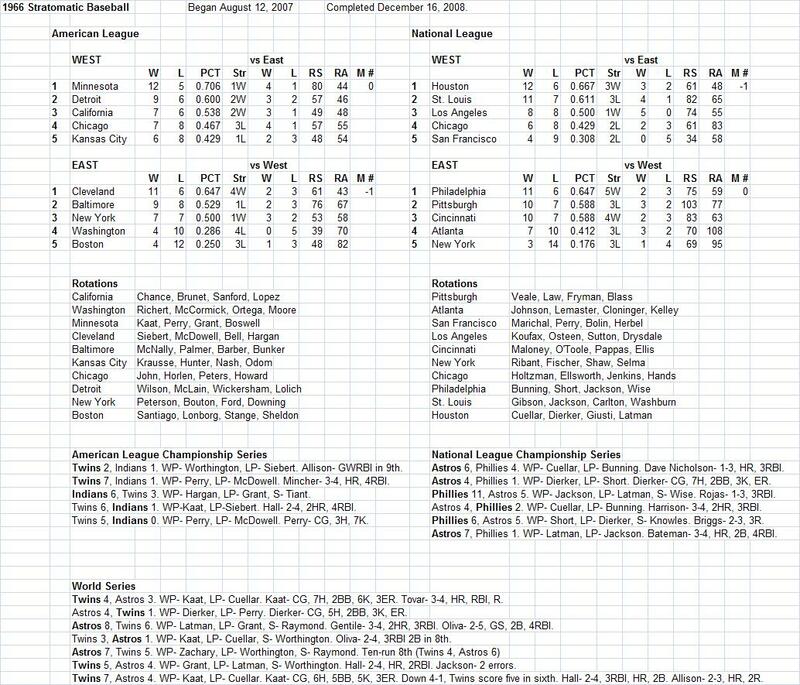 According to baseball statistician Bill James’s pythagorean formula which estimates a team’s winning percentage based on runs scored and allowed, Minnesota should have finished the season with a 79-83 record. When fans talk of the ’87 Twins, they like to talk of the team’s dome-field advantage, and they have good reason to. The Twins owned a .691 winning percentage and a 56-25 record at the football stadium they called home for too long. What fans tend to not mention is how nasty the team was on the road. Minnesota was just 29-52 away from home (.358). In 1987, home-field advantage in the playoffs and World Series simply alternated every season. Having the best record in your league or winning the all-star game did not matter. Coincidentally, the Twins got lucky twice and “earned” the advantage in the championship series and World Series. (They got lucky again in 1991.) It didn’t matter too much against the Tigers as we took two of three in Detroit to take the pennant. It did matter against the Cardinals as the Twins became the first team in baseball history to win all four games at home and lose all three on the road. 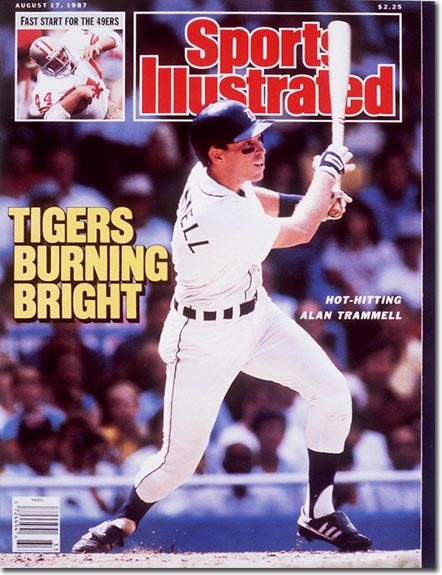 Alan Trammell led a great Tigers team in '87 with a .343 average, 28 home runs, 105 RBI, 109 runs and 21 stolen bases. Toronto owned the best ERA in the American League in ’87 at 3.74. The Twins were almost a full run behind at 4.63 to put them in 10th of 14 teams. The league average was 4.46. Despite being known as a great hitting team, Minnesota ranked just eighth in runs scored with 786, behind the league average of 794. The Tigers, the team we whipped in the ALCS, scored the most runs in the AL with 896. Both the Twins’ batting average (.261) and on-base percentage (.328) rank below the league average. Only the team’s slugging percentage .430 ranks above the league average at third in the league. Looking at the starting lineup, it’s not difficult to see how different the ’87 Twins are from today’s players. We’ve been spoiled as of late having one of the game’s best hitters as our starting catcher. In 1987, the Twins catchers were very un-Mauer like. Tim Laudner played 113 games, 105 in the field. The Twins’ main catcher hit .191 with a .252 on-base percentage. His backups were Sal Butera (.171 / .217) and Tom Nieto (.200 / .276). 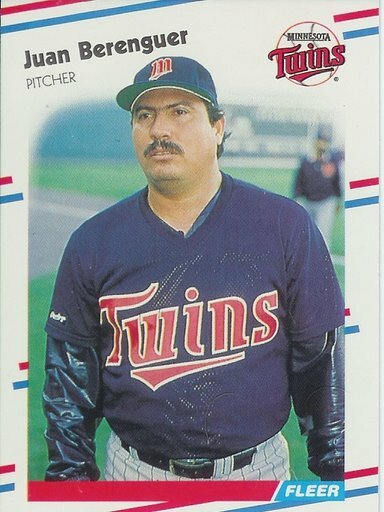 The only catcher who hit well (in fact, very well) was Mark Salas (.378 / .431 / .622), but the Twins traded him in June to the Yankees to get Joe Niekro. Leadoff batters are usually one of the team’s best at getting on base. Dan Gladden, acquired in a trade with the San Francisco Giants just before the season began, finished the season with a .312 OBP. Shortstop Greg Gagne, who could be found in the second spot many games, had a .310 OBP. The Twins won the AL West by two games over the Royals. The race wasn’t as close as the standings look as after clinching the division, the Twins dropped five straight to finish the season. I believe I remember Kent Hrbek saying in his autobiography Tales from the Minnesota Twins Dugout that it wasn’t that they lost their edge after clinching the division, they just couldn’t play with a hangover. They held their largest division lead of the season the night they clinched the title with a seven-game edge. They’d lose five games of their lead in the next six days. As for the rest of the division, Kansas City was the only other team to finish above .500. Despite this fact, the top and bottom of the division were separated by only 10 games. Texas and California were in the cellar with a 75-87 mark. The 1987 Twins pitchers consisted of Bert Blyleven, Frank Viola, one other starter who could be depended on, one reliever that didn’t worry fans when he came in the game and a scattering of players the Twins guessed, checked and discarded throughout the season. Before spring training, Minnesota traded Al Cardwood, Neal Heaton, Jeff Reed and Yorkis Perez to Montreal for Tom Nieto and Jeff Reardon. Reardon (a.k.a. The Terminator) had accumulated 162 saves for the Expos and Mets and a 3.11 ERA. The man Puckett sarcastically nicknamed Yakity-Yak saved 31 games in ’87, won eight, but also lost eight and sported a 4.48 ERA. He averaged 1.6 home runs allowed per nine innings pitched, which would have put his total near Blyleven’s (46) had he been a starter. Mike Smithson started 20 games and could only manage four wins and a 5.94 ERA. The Twins traded Mark Salas in June to get Joe Niekro from the Yankees. Niekro went on to win four games in 18 starts with a 6.26 ERA and got himself thrown out of a game for keeping emery boards in his back pocket. Relief pitcher George Frazier made his way to the Twins before the season in a trade that sent Ron Davis to the Cubs. Considering Davis’s stats, it’s sad Frazier was an upgrade after he won five games and posted a 4.98 ERA in ’87 (Davis had a 9.08 ERA in ’86). After looking good for the Phillies in the first half of the season (3.38 ERA), Dan Schatzeder came to the Twins via trade in June and posted a 6.39 ERA over 43 2/3 innings. Joe Niekro moments before being thrown out of a game for keeping emery boards in his pocket to doctor the ball. 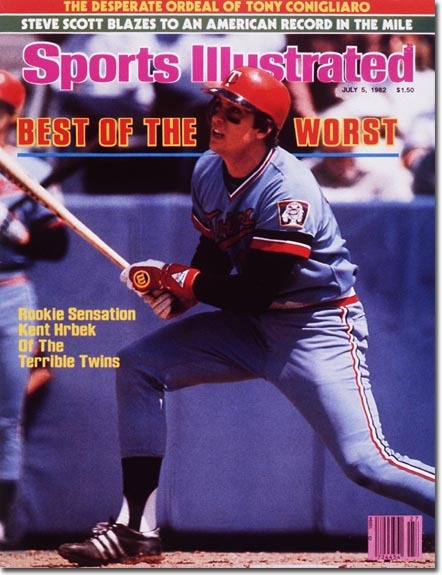 Allegedly, when Niekro tossed it out of his pocket, Kent Hrbek tried to cover it up with his foot. The Twins even picked up a future hall of famer at the trading deadline to help out the pitching staff and he was outright nasty. Forty-two year old Steve Carlton won one, lost five to go with his 6.70 ERA in 43 innings. Then there was Mark Portugal (7.77 ERA, 44 IP), Joe Klink (6.65, 23), Roy Smith (4.96, 16 1/3), Allan Anderson (10.95, 12 1/3), Jeff Bittiger (5.40, 8 1/3) and Randy Niemann (8.44, 5 1/3). Looking at all of these numbers, it’s hard to believe this team finished above .500, let alone won the division, dominated the ALCS and won an exciting World Series. I love baseball and I know a lot about it. I know a lot of facts. I know Kirby Puckett batted .356 in 1988. 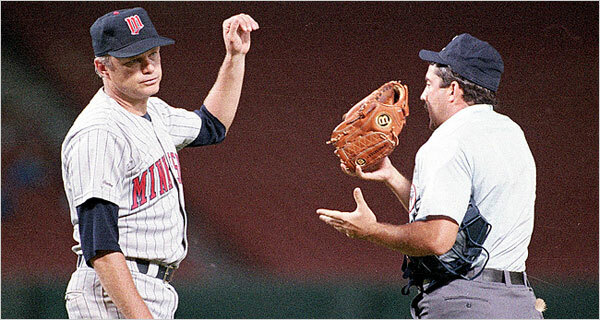 I know Chuck Knoblauch and Paul Molitor batted .341 for the 1996 Twins. I know Cristian Guzman led the American League in triples in 2000 and 2001. I know these things off the top of my head. What I don’t know is if the Twins would do better with J.J. Hardy in the No. 2 spot or the No. 9 spot. I don’t know the best way to motivate an English-as-a-second-language player like Luis Rivas. I don’t know when to pull Francisco Liriano in terms of his arm’s health and how he’s pitching. No one knows these things. They’re matters of opinion. Some people have better opinions than others, but this is also a matter of opinion. I am pretty sure I – a baseball fan who has never worked in the game aside from playing it as a kid – don’t have the best opinion on how to manage a game. I am also sure Twins manager Ron Gardenhire knows a lot more than I do and is doing a fantastic job. I didn’t think this opinion needed to be said, until I read Joe Posnanski’s latest column: http://joeposnanski.si.com/2010/09/17/my-annual-gardy-rant/ . 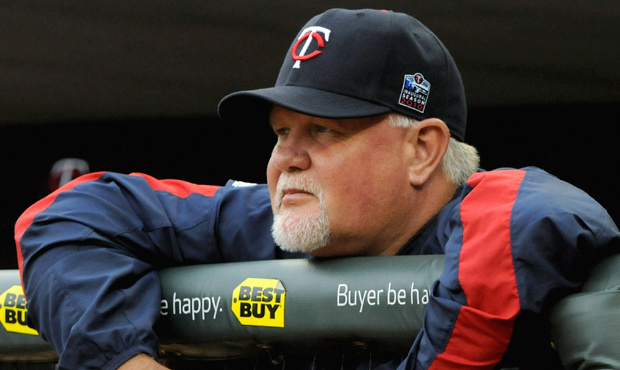 In 2008, I wrote a series of columns stating what I believe — that Ron Gardenhire is the best manager in baseball. This led more than a few people to believe that I was completely off my rocker and many of those people were Minnesota Twins fans who watched the man manage every single day and, as such, could recite hundreds and hundreds of reasons why Gardenhire was, in fact, a dreadful manager. Who are these Minnesota Twins fans? What games are they watching? More importantly, what standings are they looking at? I think Gardenhire has done a fantastic job since taking over for the 2002 season. He’s won every year with the exception of 2007. But my opinion is not the main point here. My question is how do these critical fans make themselves experts on the subject? Managing is so much more than filling in the lineup card and calling for hit-and-runs. A manager has to keep everyone motivated and happy, deal with the media, communicate with upper management, work with the fans, scout the opposition and his own team and farm clubs and then he has to manage big league baseball games. Gardenhire has taken a small-market team and made it into a perennial playoff team. The Twins have been in the playoffs six (I’ll count this year) of the last nine years, or seven if you count the one-game playoff against the White Sox in 2008. With the exception of the last few years, the Twins have played a totally different kind of baseball than the rest of the American League. While the other teams were winning with three-run home runs, the Twins were playing small-ball like it was 1982. Take a look at the lineups of the 2002-2005 Twins: there’s really nothing to be scared of if you’re an opposing pitcher. If you’re a Gardenhire hater and this doesn’t convince you, that’s fine. I’m just a non-professional baseball writer who has never worked in the game. I don’t have much credibility … but neither do you. Ron Gardenhire - a much respected man among peers and my family. When I told my friend Josh that I liked to keep score at baseball games, he quickly replied, “Do you listen to the radio broadcast on your headphones, too?” No, but that’s not a bad idea. Rarely do I see others keeping score at games these days. If I do, they’re usually at least 20 years older than me. Scorekeeping is dying in ballparks around the country and in its place are excessive drinking and eating. Why would a ballclub push a $1 scorecard on you when they can more easily sell $8 beers and $4 hot dogs? For the record: you can easily enjoy one of each. When I keep score at a baseball game, I feel more in tune with what’s happening. I’m not relying on the whims of the electronic scoreboard to know what’s happening. Although it can be a pain carrying a pencil and scorecard around, it’s well worth the effort after I’ve recorded that game in my scorebook. Somewhere among my old belongings at my parents’ house, there is a scorecard from game 7 of the 1991 World Series. It’s about the best keepsake you can have from a memorable game. Also, on my wall in my living room in a frame is the scorecard I kept from the Twins’ one-game playoff against the Tigers to settle the AL Central in 2009 – otherwise known as Game 163. Everyone keeps score in a different way. The most common is to draw a line from home to each base to show the batter’s progress in an inning. I keep score the way the 2005 Pittsburgh Pirates scorecard suggested. It was at my first game at PNC Park that, on a whim, I decided to keep score. I hadn’t done it since I was a kid. I’ve been hooked ever since. 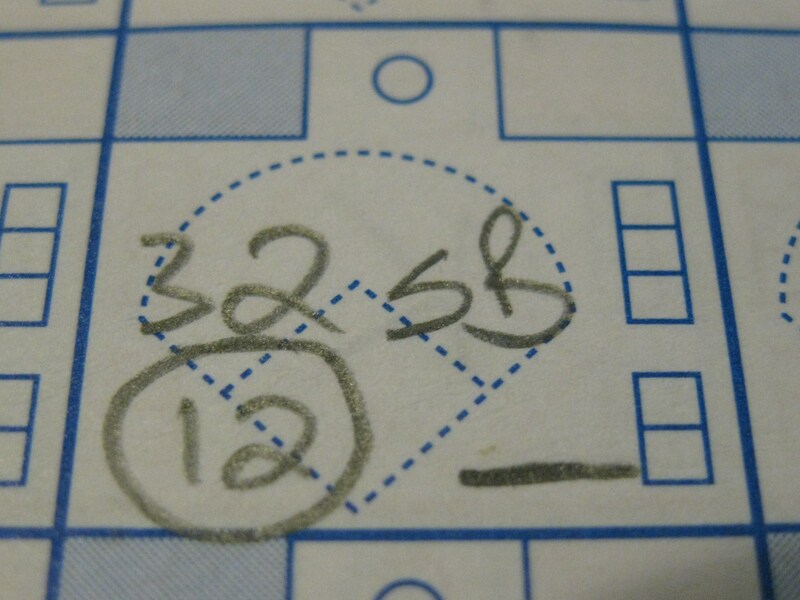 Each corner of the batter’s box in the scorecard represents a base. The lower-right corner is first, upper right is second, upper left is third and lower left is home. In each corner, something must be marked to show how that batter got to that base or was thrown out at that base. If the batter doesn’t get to any base, the outcome can be written in the middle of the box. A single is represented by a single line, a double is two and so on. A single got this batter to first base. He then stole second and got to third base based on what No. 32 did. The batter scored off of No. 12's actions. Standing near the left-field foul pole at a recent Twins game, I was surrounded by fellow fans who, like me, did not have a seat. It was a standing-room-only crowd and we couldn’t see the main scoreboard from our viewpoint. As the one guy who was keeping score, I became a bit of the area statistician. I had all the answers right in front of me. The Twins pitchers struck out 15 batters in that game. Sure, I can go to baseball-reference.com and look up the box score, but my scorebook is exactly that … mine. It’s my personal connection to the game. The box score won’t have numerous exclamation points after the opposing team flied out to center field because the box score just says Konerko flied out to center while I’ll remember it as Denard Span robbing Paul Konerko of a home run. One of my favorite scorebook entries. After a double, fly out to left field and a single to put runners at second and third, the Yankees brought in the great Mariano Rivera (the hard line between batters represents a pitching change) to face Delmon Young. I think the final entry is self explanatory. I’ve even gone so far as to keep score of important games on TV. There are a number of playoff and World Series games in my scorebook. It’s something to keep me occupied while sitting on the couch. Unfortunately, a good scorecard is getting more and more difficult to come by at parks. Many times a program has to be bought where the scorecard can be found inside. Sadly, there’s usually little room to write and sometimes there’s not even a spot to record the pitchers’ statistics. Scorecards are so cheap, I think teams (minor leagues and majors) should have a scorecard day where every fan is given a scorecard and pencil (complete with team name and local sponsor) as they walk in the park. Instructions could be given on how to keep score on the card as well as the scoreboard throughout the game. Historian Doris Goodwin Kearns has talked about how she used to keep score of the Brooklyn Dodgers games during the day and when her father came home from work, she would give him a play-by-play based on her scorecard. With the internet and sports television networks, the scorecard is dying. The same was said of listening to music on records a few years back and vinyl has made a comeback recently. Why not the scorecard? 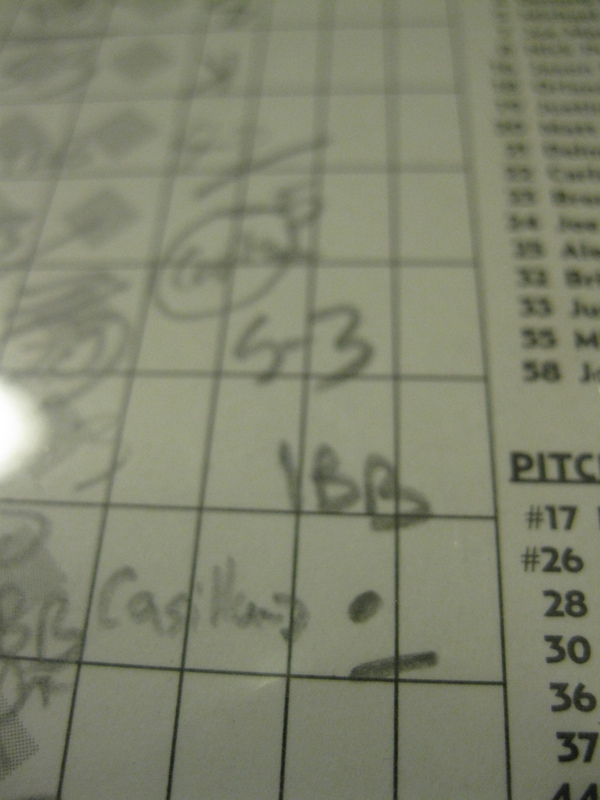 Aside from Gene Larkin's 10th inning single, this is my favorite scorecard entry. My Game 163 Metrodome-bought card was a mess by the 12th inning in 2009. I didn't even have room to enter Alexi Casilla's name as a pinch hitter before he knocked in Carlos Gomez to score the winning run. Some people play Dungeons and Dragons. Some play Magic cards. Some read horrible romance novels. Some watch reality television. Some people show up to Star Wars and Harry Potter premieres in costume. Me, I play Strat-o-Matic baseball. I’m not ashamed because everyone does something dorky like this. For years, since I can remember loving baseball, I’d been trying to find a simulation game that encompasses the actual game. Most of the time I was trying out baseball video games in hopes to getting an accurate representation of the game I loved. I never cared about graphics or how real it looked – I only cared about how accurate it was statistically. I needed something that let me be the manager. I found brushes with what I was looking for. My friend Nick had a statistics based game for his Apple IIE called MLBPA Baseball, based on the 1986 season. There were no graphics except a diamond draw out in green and the fielders and players who were on the field at the time. I remember playing a game in which Greg Gagne hit two home runs. I loved playing the original Hardball!, but there were only two teams with fictional players and it was horribly inaccurate to the real game (only certain players could steal or hit home runs). Then there was Tony LaRussa Baseball for the PC. It featured only retired players and it was the most realistic video game I’d played. Sadly, you had to buy separate disks to get the AL and NL stadiums (about $15 apiece). The gameplay was accurate and there was a coaching feature where you didn’t have to actually move the fielders. You just had to make the calls from the dugout. It was a great game, but died once my family’s computer became obsolete. High Heat Baseball for the PC wasn’t bad, but still wasn’t quite what I was looking for and the same can be said for MVP Baseball for the Gamecube. I don’t care how much the batter really looks like Jason Bay. I just want Jason Bay to hit like he did in 2004 and I want it to matter whether he’s facing Johan Santana or Kris Benson. I want it to matter whether the ball is hit to Omar Vizquel or Jose Vidro. There’s a difference. Then my girlfriend and I stopped by a board games store in the mall the autumn of 2004. I’d heard stories of baseball games played with dice based on hitters and pitchers statistics, but never seen one. It was there I finally found the most accurate baseball simulation – Strat-o-Matic. My girlfriend bought it for me that Christmas after watching me drool over it in the mall. When I showed it to Nick that evening, he said, “So, this is the sort of thing you need a 12-step program to get out of?” I’ve been playing for six years and Nick’s statement couldn’t have been more accurate. What is Strat-o-Matic? I like to tell people it’s Dungeons and Dragons for baseball nerds. From afar, it looks insanely difficult and far too in-depth for the casual fan. I’ve never played Axis and Allies, but I’d imagine that’s equally in-depth. When you get your Strat-o-Matic set, you get a separate card for each individual player from that respected year (mine was the 2004 season) with two sides to each card. One side contains the information and statistics for the basic game and the other side is for the advanced and super advanced. After a thorough reading of the basic instructions, I began to play and instantly fell in love with the game. It wasn’t long before I learned the advanced and eventually the super advanced. Even though the first two games are accurate in their play, now that I’ve mastered the super advanced play, I’ll never go back and can’t stand playing a “lesser” game when playing with someone else. I’ll do my best to sum up how the super advanced game is played. 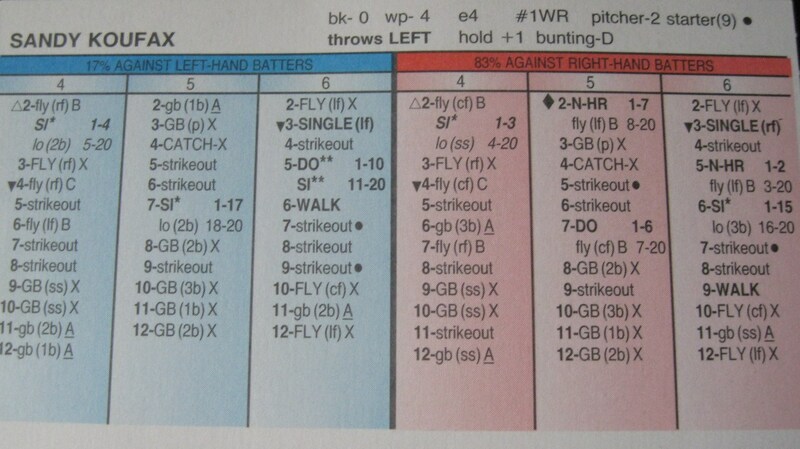 A hitter’s card has two sides to it. One side is for when he’s facing a right-handed pitcher and the other for lefties with the numbers one, two and three headlining the columns. It’s the same for a pitcher’s card, only it matters what side of the plate the batter is on with four, five and six on top of the columns. A single die is rolled. If the number is one, two or three, the outcome of the at bat will be based on the hitter’s card. If it’s four, five or six, the outcome will be based on the pitcher’s card. Then two more dice are thrown. The sum of the numbers will direct you to the corresponding number in the column in which the first die was thrown. (Click on photo to enlarge) Roberto Clemente's 1966 card. The left side (blue) is dedicated to if he's facing a lefty and the right is for right handers. In the upper left-hand corner you'll notice "rf-1(-5)". This means Clemente's range in right field is rated as 1 (the best) and his arm is a minus-five (also the best). Sometimes the outcome will be something simple like “Fly LF(B)”. This means, with no one on base, the batter has flown out to the left fielder – one out. Simple, right? Or maybe it will say “Strikeout” or “GB 2B(A)”. The latter would mean, with no one on base, the batter grounds out to the second baseman. Every outcome is aligned with the probability of the sum of two dice. The most likely sum of two dice is seven. The second most likely is five or eight. The least likely is 12 or two. Let’s say a batter hit only three home runs over 600 plate appearances. If he’s to hit a home run, a two or 12 would likely have to be thrown. However, if a batter hit 45 home runs, the home run sum would likely be three or four. Strat-o-Matic also considers the fielders. If an outcome says “GB SS(X)”, the “x” means the play will unfold based on the shortstop’s fielding range and ability. Each infielder is rated on two fielding scales: range and errors. Range is ranked from one (best) to five. The probability a fielder will make an error is based on the number of errors he made that year. Sandy Koufax's 1966 card. Notice there aren't many hits or walks and many strikeouts. Without explaining each rule, I’ll just mention everything that’s considered in a game of Strat-o-Matic baseball: an outfielder’s arm, a catcher’s arm, a pitcher’s ability to hold runners, a hitter’s hit-and-run and bunting ability, a baserunner’s speed, ability to get a good lead for a stolen base and stolen base chances, a pitcher’s likelihood to commit a balk or wild pitch as well as his endurance, a catcher’s throwing error rate as well as his passed ball ratio and a hitter’s clutch-hitting ability. Strat-o-Matic also takes into consideration the size of a ballpark and the likelihood for home runs and singles. There’s also a 20-sided die involved for most plays, which makes it even more geeky. 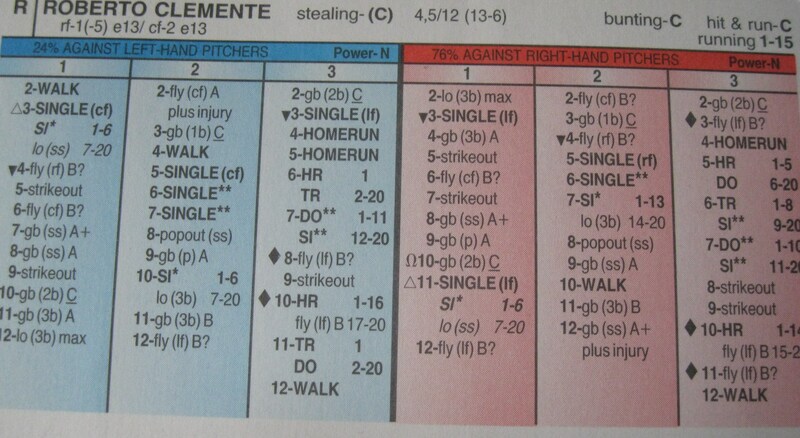 Just about every aspect of baseball is considered in Strat-o-Matic. You can purchase many season sets from the dead-ball era through the 2009 season. I own the 2004, 1966 (Koufax’s final year) and 1911 sets (Ty Cobb and Joe Jackson bat over .400). For the 2004 set I took the top five teams in the leagues and made them give up their two best players to the bottom five teams in the league for better parity. After dividing the teams into five divisions, I played out a small season of about 10 games apiece and had a playoff to determine the champ (Florida Marlins). For the 1966 season I left the teams as they were and created an unbalanced schedule with two divisions. I wondered if I’d end up with a Baltimore vs. Los Angeles finals, but it played out differently. The Twins ended up defeating the Astros in the finals. The main page of the Excel spreadsheet of my 1966 season. I split the leagues into two divisions and created an unbalanced schedule: one game against other division teams and three against own division rivals. I’m a little over halfway through my 1911 season. The AL half is done with the Philadelphia Athletics easily taking the pennant (much like what really happened). When I’m in the mood to play (usually in the fall and winter months), I’ll take in four or five games a week. Playing a game includes throwing at least three dice for every at bat and scoring the game. The depth of scoring is up to the player. I started simply keeping track of wins and losses for each team, but have progressed to keeping basic hitting and pitching stats. I keep hitting statistics for the first four or five batters in a lineup and all pitchers. I work nights and don’t have kids, so I’m usually up until at least four a.m. What else am I going to do with my time in the middle of a Wisconsin winter after I’ve exercised, socialized with friends, watched a movie and read a book? I read somewhere that baseball broadcaster John Miller honed his play-by-play skills playing Strat as a kid. It’s dorky, I know. But when I think of the time I’ve spent over the statistics and simulated play, I think of other people using that time to watch Two and Half Men or read James Patterson novels or watch the first three quarters of an NBA game. Then I realize that everyone wastes time in their life. If you’re going to waste time, it might as well be with something you’re passionate about and doesn’t involve dampening your eyesight or dropping your brain cell count. My 1911 season so far. The American League schedule is complete and I've just started the National League. With the importance of the World Series and the excitement of the league championship series (the Final Four of baseball), the division series often gets overlooked. Sometimes it’s for good reason, but not always. The division series marks the beginning of the baseball postseason and is about a month away. It’s only a best-of-five series and many times is over in the minimum games. But there is an excitement to the division series and is slowly developing its own history. The World Series began in 1903. The championship series began in 1969. The division series is only 15 years old, having begun after the 1995 season (technically, it would have begun after the 1994 season if there hadn’t been a strike). Major League Baseball has just the right amount of playoffs. There’s not too much like the NHL and NBA and there’s not too little like college football. The NHL and NBA welcome 16 teams into its playoffs while college football only has one game to determine the national champion. Unfortunately, much of the division playoffs are over far too soon. Eight teams make it to the major league playoffs; four from each league. There’s the three division winners and one wild-card team. The division winner with the most wins in each league plays the wild-card team, unless that team is in the same division as the team with the most wins. In that case, the team with the most wins plays the division winner with the least wins. Since the division series began in 1995, there have been 60 series. Of those 60, 25 (42%) of them have been sweeps. Only 13 (22%) of the division series have gone to a deciding game 5. This can be compared to baseball’s championship series, which was a best-of-five series until it was changed to best-of-seven in 1985. From 1969 through 1984, 10 of 32 championships series (31%) went to a fifth game. 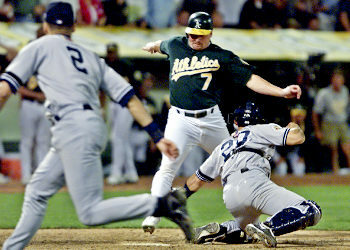 Thanks to Jeremy Giambi's inability to slide into home plate on a close play, the A's managed to drop the fifth game of the ALDS four seasons in a row. There is a lack of excitement in the first round of playoffs. Is it because the best teams are just that good? The team with the best record in its league has a 20-10 series record in the first round. Among those 20 wins, the top team in each league hold a 57-6 record. In the 10 series losses, the top team’s record is 13-33. When the favorite team wins the division series, it does so quickly most of the time. Yes, there are upsets, but the seeding in the playoffs seems to fit well. When the division series begins in early October, I’ll be hoping for as many five-game series as possible (minus the Twins). Never has all four division series in a year gone five games. In 2001, three series went to a deciding game 5. That was the only time three series went that far. Two series in each 2002 and 2003 went five games, but those were the only years more than one series went beyond four games. If it’s excitement baseball fans are looking for in the division series, a big thanks needs to go out to the Oakland A’s. For four straight years (2000-2003) the A’s took their respective division series to the fifth game … and lost every one of them. In 2001 and 2003, Oakland won the first two games and then dropped three straight. Although the Braves played in the division series every year from 1995 through 2005, they didn’t make things all that interesting. Only three times did Atlanta take the series to five games and they lost all three times from 2002 through 2004. From 1995 through 1999, the Braves dominated the division series with five series wins and a 15-2 record. Beginning in 2000, it all fell apart for Atlanta as it would win only one series in the next six years and compile a 10-15 record. The Minnesota Twins would love to say it had 10 wins in the division series, but they’re far from that. After a surprising 3-2 series win over the A’s in 2002, Minnesota has lost four straight division series and a 2-12 record. The Twins’ last division series win was the first game of the 2004 postseason. They have lost nine straight since then. The greatest division series is arguably from its first year when the Seattle Mariners defeated the Yankees on an exciting fifth game. After losing the first two games in New York, the Mariners stormed back to win all three games in Seattle (in the first three years of the division series, the top-seeded team would play all three of its home games in the final three games, if they were necessary). Ken Griffey Jr.’s mad dash from first to home on a double by Edgar Martinez in the bottom of the 11th inning at the Kingdome has become part of baseball legend. The second game of that series went 15 innings where New York eventually won while the fourth game was tied 6-6 before the Mariners would score five runs in the bottom of the eighth to help Seattle to an 11-8 victory. 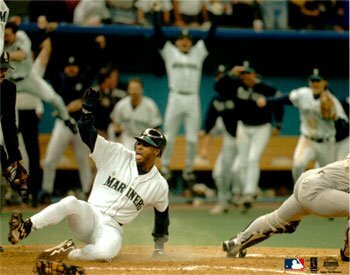 Ken Griffey Jr.'s mad dash from first to home on a double by Edgar Martinez to end the 1995 ALDS with the Yankees may be the best moment in Mariners history. It’s difficult to pick a best game of the division series. There are no Major League Baseball “Best of the Division Series” DVDs or highlight shows on ESPN Classic. The division series is largely forgotten after it’s done. The championship series doesn’t get the hype the World Series gets, but there have been many memorable moments documented on film. The one division series game that sticks in my mind was the fourth game of the 2003 series between the Giants and Marlins. Florida was up 2-1 in the series after losing the opening game. Playing in Miami, the game was tied 5-5 going into the bottom of the eighth. Two quick outs were recorded before Ivan “Pudge” Rodriguez singled. Derek Lee was hit by a pitch, putting Pudge on second. Miguel Cabrera lined a single to right field. The throw home beat the runner, but Rodriguez put all of his pudge into catcher Yorvit Torrealba and knocked the ball loose allowing Lee to score as well. The Giants needed two runs to keep the game going in the top of the ninth and it looked like they might get both of them after pinch hitter Neifi Perez doubled and J.T. Snow singled to score the runner. The next two Giants batters were not able to advance Snow on their outs, but Ray Durham did the hard way when he was hit by a pitch. With the tying run on second, the go-ahead run on first and two outs, Jeffrey Hammonds stepped up for San Francisco. His single on a line drive to left field gave the Giants a chance for revenge on Rodriguez. The throw arrived ahead of the runner, but J.T. Snow had the same idea Pudge had a half-inning earlier – knock over the catcher and get the ball loose. 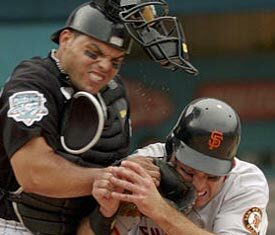 But Pudge is not known as one of the greatest catchers of his generation for nothing. Pudge held the ball for the final out of the division series and began his celebrating laying on his back, clutching the ball and screaming at the sky while his teammates hog piled on top. Despite the hard hit from a charging J.T. Snow, Ivan Rodriguez did not drop the ball and helped the Marlins to an eventual World Series championship. Many see the division series as a formality before the championship series. It doesn’t have to be this way. It’s still a do-or-die situation for every team. So let’s root for as many five-game series as possible. There’s not much baseball left in the year once the division series rolls around, so let’s get the most we can while we can. The first round of the playoffs should be remembered because without winning the first round, you’ll never get to the World Series.